If your school uses Populi Library, you can use it to search the catalog, place holds, leave recommendations and reviews, and keep track of your activity (books you've borrowed, fines to be paid, etc.). Calendar shows you library hours, including any extended closures (like holidays, etc.). Links includes links to other sites outside of Populi Library. 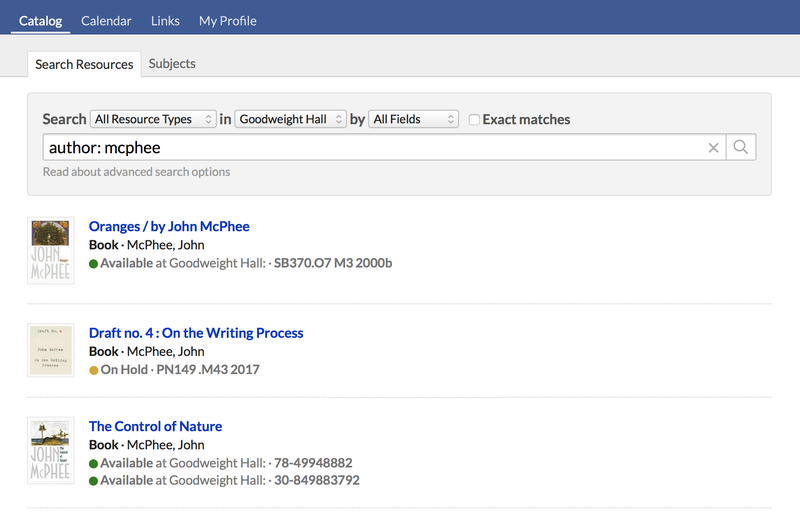 Use the drop-downs to confine your search to specific resource types, libraries, or fields. Check if you wish to confine your search to an exact match of your search term. You can also browse resources by Subject. 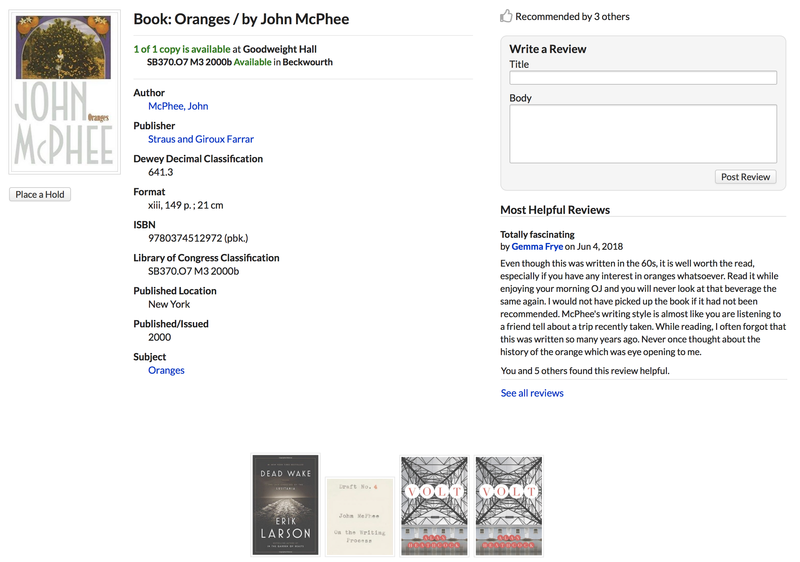 On the resource page, you can place holds and find bibliographic information, details about where to find copies, and recommendations and reviews from other patrons. To place a hold, click Place Hold under the cover image. Choose the library and a particular copy. After you place the hold, you'll receive an email when it's ready for pickup. Click to recommend a resource (and click it again to rescind your recommendation). You can also post reviews. My Profile shows your Library-related activity—circulation and reviews. 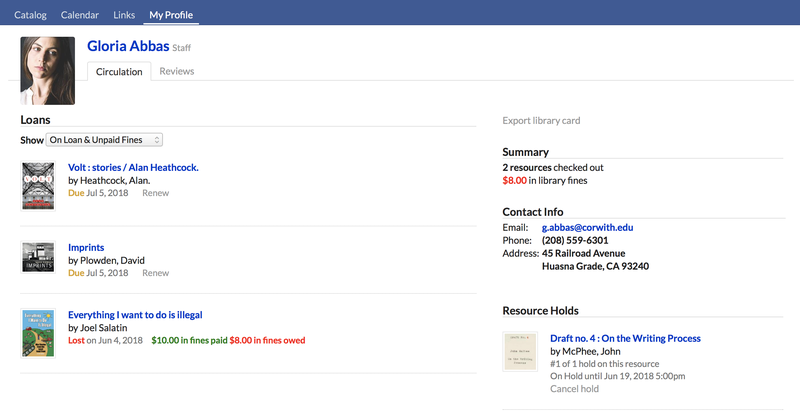 If you're a staff-level patron, you can export your own library card. If you're a student- or faculty-level patron, your school ID card (available on your regular Populi profile) doubles as a library card. Under Loans, you'll can find a complete history of all the resources you've ever checked out. You can renew currently checked-out resources; if you have fines, you'll see those listed next to overdue/lost loans. Under Holds, you'll see anything the library is currently holding for you. If you need to, you can cancel the hold. We also use Athena, so I'd be curious to know what develops as far as admin migration tutorials. I'm very glad to see this update! Are there "reports" that provide statistics on circulation and holdings? Is there an example of the manual input form? How do you do materials designations? What is the maximum number of book records that can be hosted in the catalog? Do you store the data or is it on our server? Is the Marc record preserved in case we ever want to migrate away? Is there a trial I can see? I'm putting the finishing touches on the Admin-level Library documentation; this article is meant for student and faculty users who are just trying to search the library and perform basic Patron tasks (leave reviews, etc.). There is no limit to the number of records you can store in the catalog. We store the data; it is securely backed-up with numerous redundant safety systems. We will be shortly adding a MaRC exporter to Library; while in Populi, the records are stored in our database format which is just as detailed as a MaRC record, but vastly more efficient, searchable, speedier, and space-saving. We can import MaRC records from legacy systems. Reports for circulation and holds are built-in and easy to find. I'll do my best to get the other Library documentation out there today. As for seeing what it looks like, would you like me to create a login for you on our demo site? That would probably be the best way for you to get a sense of how it works. Thank you, Brendan. We would LOVE to have a link to the demo site and any other information that you can provide. We are currently using ATHENA as our catalog--it is no longer supported by the manufacturer, but we've been able to keep it alive so far. We do have several alumni and area pastors who currently use our catalog. I'm assuming that only those with Populi log-ins are able to access the catalogs your host. Is that correct? Ideally, though not all users would have a user profile, I'd like for the catalog to be open to anyone who wanted to search it. Send an email to support@populiweb.com with the names and emails of the people at Free Will who'd like to look at the Demo Library. Then I'll get them set up. I realize now that this article leaves out something important--anyone can browse your Library Catalog using the Search Resources and Subjects tabs. To leave review or check things out, they'd need to be in Populi as a Library Patron (which is a new user role) or as Student, Faculty, or Staff. So, yes, area pastors and alums can check out resources using Populi Library. We're fielding lots of requests and ideas from customers, so we expect we'll be building it out a lot more in the coming months (while juggling other development projects). But the documentation above covers just about everything. As I learn about what workflows are important to people, I'll add more to the docs. Thanks everyone! We do look forward to your thoughts after you put Library through its paces. @Deborah, if you want to try out Library on our demo site, send an email to support@populiweb.com with the names and emails of everyone at CBTS who'd like to try it out.